Home » Conservation Action Makes A Difference! Conservation Action Makes A Difference! While conservation planning happens at international, national, or ecoregional scales, action is best taken locally by those who know how the lands, waters, and human and natural communities will respond. To meet our objectives and address threats to landbird, PIF depends on a broad range of partnerships among agencies, organizations, educators, academics, and industry. 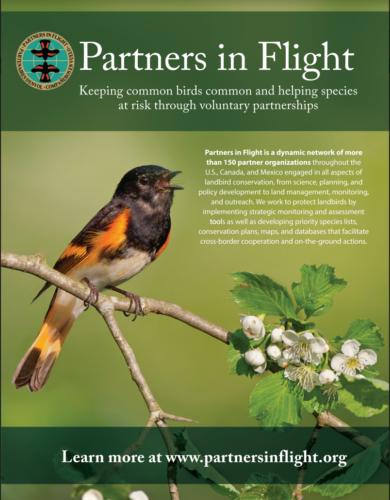 Migratory Bird Joint Ventures (JVs) are the primary implementation arms of PIF and other major conservation initiatives. As illustrated in the following examples, JVs achieve range-wide habitat objectives for birds, and reflect local culture and environmental priorities of their geographic regions. In the U.S., more than 850 million acres of land are managed and conserved for the benefit of the American people. These public lands are critical to bird conservation: more than 30 Watch List species have 50% or more of their U.S. distribution on public lands, especially in western forests and aridlands. Conservation actions taken by federal and state agencies can impact millions of acres and influence population responses of many species. Private landowners similarly provide vital habitats for birds, especially declining grassland and eastern forest species, on about 60% of the total land base in the United States. As private landowners integrate best management practices that target quality habitats for birds as well as their livelihood and personal interests, bird populations respond. Pacific Birds Habitat JV is one of several U.S-Canadian partnerships contributing to the conservation of priority landbird species that depend on boreal forest, alpine tundra, and highly threatened oak and prairie habitats. Partners have raised millions of dollars to match Neotropical Migratory Bird Conservation Act grant funds that support landscape-scale restoration projects in southern Oregon and northern California. Accomplishments include land acquisitions: four (1,200 acres) in the U.S.; three (120 acres) in El Salvador; 40,000 acres in Guatemala and Costa Rica; and habitat management and restoration at 20 sites in Oregon, Washington, and British Columbia. Bird monitoring and research are occurring at more than 100 sites in California, Oregon, and Washington as are inventories for the endangered Golden-cheeked Warbler at numerous sites in Latin America that also support Pacific focal species such as Hermit and Townsend’s Warblers in winter. The Playa Lakes JV has identified priority grassland areas for conservation and helped incentivize landowners, through the use of U.S. Department of Agriculture Farm Bill conservation programs such as the Conservation Reserve Program (CRP), to convert cropland back to grassland. The job of private lands biologists is to sensitively match landowners with suitable conservation practices. For the past 25 years, through its ConocoPhillips grant program, the JV has awarded $2.5 million in grants to support 150+ conservation projects on 68,000 acres of bird habitat—much of that in grasslands. In addition, the JV offers capacity grants to increase the ability of programs or organizations to develop and deliver effective habitat conservation. Coastal marsh conservation is a high priority in the Atlantic Coast JV as it supports many species of highest concern, including Saltmarsh Sparrow, Black Rail and American Black Duck. Most saltmarsh habitat in north- eastern and mid-Atlantic states has been lost or degraded by centuries of draining and filling and the spread of invasive species. JV efforts focus on providing refugia for saltmarsh-obligate species, and partners have conserved more than 200,000 acres of coastal marsh in the last two decades, largely through the NAWCA and Coastal Grants programs. Partners ranging from individual landowners to organizations like The Nature Conservancy are restoring tidal flow and natural hydrology, acquiring lands adjacent to saltmarsh, facilitating the creation of future saltmarsh habitat, and allowing for saltmarsh migration. A major priority of this JV partnership is to improve the health and resiliency of Appalachian forests for landbird populations. Appalachian partners have made substantial progress for two high-priority species: Golden-winged Warbler and Cerulean Warbler on both public and private lands. By engaging private landowners through two Natural Resources Conservation Service (NRCS) initiatives, including Working Lands for Wildlife and the Regional Conservation Partners Program, partners across five states have committed tens of thousands of acres of private and public lands for habitat enhancements and conservation easements. In addition, 1,000 acres of legacy surface mine lands in Kentucky are being reforested with deciduous species such as blight-resistant American Chestnuts.